The latest stop on the caravanserai that is Europe’s current season of cruise shows is Reggio Emilia, the historic north Italian city and birthplace of Max Mara which presented a polished and artistically inflected show on a wild and wet Monday night. Creating an art collection for a great fashion house is nothing terribly new. Using it as the inspiration of a powerful new collection is something else. 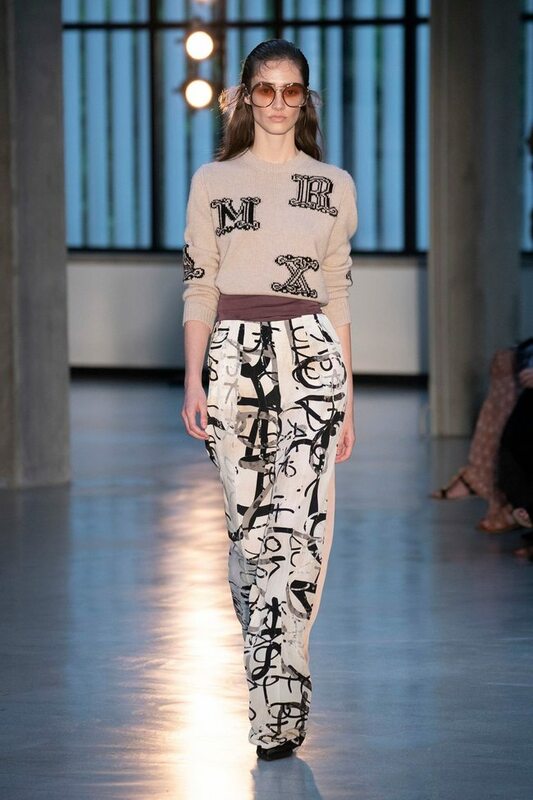 Which is what set this Max Mara Cruise 2019 collection of clothes apart, it so directly referenced the rather remarkable private art collection of the Collezione Maramotti. The very colors of the Arte Povera paintings – ecru, iron and jute – seen in the works of Fontana and Manzoni were used in fluid dusters, layered double-breasted top coats and finely cut pant suits. Ironically, Arte Povera got its name from using poor materials, while this collection came in the creamiest of cashmeres or subtly fine canvases. Collected over five decades by the family, the art collection is a testament to the remarkable eye of the house’s founder Achille Maramotti, who after buying important contemporary Italian artists in the 60s began amassing a remarkable selection of works in the 70s and 80s, Bacon, Schnabel and Kiener to name a few. A brilliant series of knits with bold graphics clearly referenced Twombly and Kounellis. The house flew in editors from Paris, Moscow, Shanghai and New York for a busy evening which began with a private tour of the art space. "It just seemed the right moment to finally stage a runway show in this space. The works of art have often inspired us but never more so than in this collection," explained Creative Director Laura Lusuardi. Founder Achille Maramotti, who opened the fashion house in 1951, first conceived the idea of a contemporary art collection in part to inspire his own workers. Hanging his purchases inside his own apparel manufacturing plant in in Reggio Emilia, the historic north Italian city. By 2007, the company had renovated that former factory into a fully-fledged, permanent exhibition space. The brand is still fully owned by the descendants of the founder, a great Italian success story with 2016 group revenues of 1.4 billion euros. The show marked the fifth major event in the cruise season on the continent, following Chanel, Christian Dior, Louis Vuitton and Gucci. All of them threatened by lousy weather. Hail stones battered the art factory this afternoon – but inside, all was calm as the cast strolled nonchalantly around a remarkable array of art to a series of waltzes and melodies from movies by Federico Fellini. Finishing, succinctly, with the theme to Amarcord, where a passing cruise liner is a highlight of the movie.